One of the decisions that had to be made Friday night was "should we stay or should we go". This was based on the forecast for Saturday - clouds, 40's and rain possible. 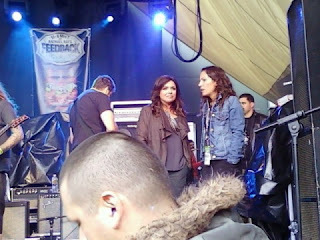 The question was should we stay out for some showcases in case Saturday was rainy and the big Rachael Ray party at Stubb's was not doable. The decision was made to go home and it couldn't really be that bad on Saturday - it was still in the 60's Friday night. I guess we missed that one as the thunder rolled in around 3 AM and rain followed - a lot of rain. The troops were still up early though and at 9:30 it was decision time so the layers came out and off we trudged on a cold Spring Break day. Good news upon arrival - easy parking right across the street, relatively short line to get in and no rain, just cold and windy. 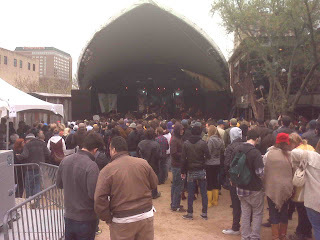 Note to self - SXSW'ers are fair weather fans. The line moved quickly and we were inside right at the start of the party. Unfortunately the weather had slowed down progress and the stages were not ready to go. Stubb's is one of the biggest venues in Austin and there were two stages - one at each end of what I call a gravel pit - because that's what it is! There was another stage inside and that's what the long line was for - to get in out of the weather. We stood in that line and got inside to see Shayna Zaid & the Catch play the final song in a 15 minute set and then back outside. Next up on the North Stage - Mishka. Now we all know he is under the direction of Austin's most famous bongo player but would he show? Of course he would so after Matthew McConaughy introduced him we got some early morning Mishka. Unfortunately I think his biggest claim to fame is his introducer! 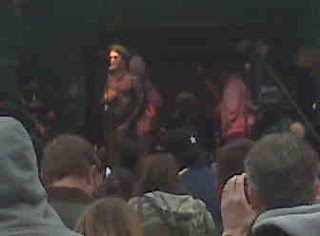 Next up on the big stage was Bob Schneider as well as our first Rachael citing of the day. She loves Bob as this was at least the second year in a row he has played her party. Later that night he won all the awards at the Austin Music Awards - something like 7 and Bob put on his normal quality set. Some days it's hard to figure out how he hasn't broken nationally yet. The new song "40 Dogs" seems like it should be getting airplay everywhere. His popularity in Austin continues to grow and on this day after the Jesse James news he seems to be in a lot better shape than his old "friend" Sandra Bullock except he doesn't have an Academy Award! Now on the big stage - The Cringe. You may say who is this Cringe he speaks of - the answer is that it's Rachael's husband's band. And THERE is the reason most of us believe the party exists. Listen to the Cringe and come back and tell me that they sound like a band that would get a 30 minute slot at any day party if they weren't connected. 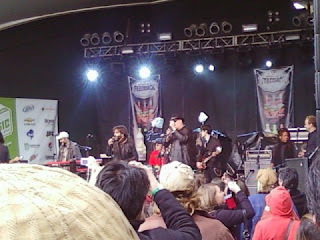 Highlight as last year was a cover song and during the cover of the Beatles we get Bob Schneider back singing backup (with the lyrics on his hand) and Mr. John Popper of Blues Traveler playing the harmonica. Hey I don't blame them for using their connections - tell me we wouldn't all do the same exact thing given the chance! While this was going on we got our chance to sample Rach's food specially made for the Austin event. There were some unique recipes but combining the outside temperature and the size of the crowd no way the food can stay hot. Somehow a pulled pork sandwich and a meatball sandwich just aren't the same when they aren't hot. I personally think Stubb's with a capacity of 2,100 is just too big for food - albeit free food. But it was a great setup with bands at both ends of the venue. On Friday the kids had tried to see the man they call Andrew WK at another party in the afternoon but weren't on the right guest list. A valuable thing you learn at SXSW - miss somebody today see them tomorrow. I had no idea what his music was but now that I have seen him I can tell you I still have no idea what his music is! The only thing I got out of it was "party" seemed to be in every song - and oh yeah he can whip his long hair around like a maniac, had several band members who look like they could be serial killers, and a chick in a leotard doing some exercises. Other than that I have no idea why anybody would pay $1 to see that so called act - call me old fashioned. The last name act we got a chance to see was Jakob Dylan and Three Legs (featuring Neko Case and Kelly Hogan). Now I am not a big Jakob fan as my only other experience with him was when he and the Wallflowers opened for Mellencamp a few years ago in San Antonio. The most memorable part of that was him complaining because no one was up dancing to his music - remember you are the opener, we are here to hear "Jack and Diane"! But I always want to give everybody a second chance and the three songs we got to hear all sounded great. They were rushed to the stage becasue Neko Case had a flight to catch as did all our guests so we had to cut short the set and head for the Austin airport. This meant we had to skip the remaining acts that we had hoped to see- Tom Morello's (Rage Against the Machine) new project Street Sweeper Social Club, Justin Townes Earle (Steve's son) and She & Him. I had been hoping to catch the Zoey Deschanel / M Ward duo all week but it never worked out. Well there's always next year. Originally I had envisioned going back out Saturday night or catching Alejandro's Sunday night closer at the Continental Club as I wanted to catch Chuck Prophet. But after 5 hours out in the 40 degree weather any more music was pretty much out of the question. So SXSW 2010 was a wrap. 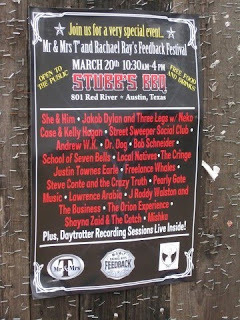 It was a great time, our visitors were overwhelmed and impressed, and plans were already being made for SXSW 2011. Hope you all enjoyed the summary and got some new things to check out! Next up - a last minute decision to grab some Elton John tickets for this Saturday at the Erwin Center - I know it's the same songs he played when we saw him 20 years ago but you can't beat a Saturday night singalong!